The Customer Portal will enable you client to communicate, upload files, and view the status of their account without having to directly contact a representative. *The Customer Portal is an extra enhancement. If you wish to activate the feature please contact sales@debtpaypro.com for pricing information and to sign an enhancement proposal for the feature. To begin you will need to set the "From Address". This determines what email address your clients will receive the portal login email from. Additionally, when a client chooses to "Send a Request" from within the Customer Portal, the request will be delivered to this address. Next, select the "Email Template" for the portal and also check the box for "Send Welcome Email" (automatically sends email upon Enrollment). If your account does not currently have Customer Portal Welcome email you can either create one or request that support create one into your account by emailing support@debtpaypro.com. Now go through and activate the different sections and functionality you want active when a contact logs into the portal. We will be logging in as a customer later and you will be able to change these setting while logged in to see the different options. You can simply check all of the boxes to begin and then remove what you do not want later, after viewing the portal as a customer. Next enter a "Short Announcement" and "Announcement Page" message. These will be seen when logged into the portal. Again, we will have a closer look at this when we login as a customer. Now that you have done the basic setup of the Customer Portal, we will login as a customer and view the portal from their perspective. Depending on the situation you may wish to create a test contact or use a dead/canceled contact for the next steps. In either case make sure the Contact has your email address saved for it. You will be sending yourself the Client Portal Welcome Email to obtain login information. Since the customer portal allows you to securely share and communicate as the customer, we do not allow you to login as the client from within the CRM. Once you have chosen a contact, go to view the Client Dashboard and locate the Customer Portal section below the Additional Information section; then click to expand the section. Click on the green "Create User" button to send the welcome email containing login information. If you are using an existing contact you may need to click on "Reset Password" to send the Welcome Email. Once you have received the Welcome Email go to the link provided and login to the portal using the credentials in the email you received. Make sure to do this in a separate browser window or tab, as you will want to stay logged into the CRM so you can make any changes to the portal settings and then see them update in the portal. Now from the CRM go back to the Customer Portal Settings (Admin Tab > Settings > Customer Portal Settings) so that you can make changes to the settings and see how they affect and are reflected in the Portal. *Depending on the File Type you are operating with, some of the options described below may differ. Once logged into the portal you should now see the announcement you have entered from the portal settings. You can now make changes to the Announcement from the Portal Settings, save, and then refresh the browser you are viewing the portal in to see the changes. The profile will display some basic information of your choosing. The profile displays field information based on an in-take form. You may choose to use your normal in-take form or create a form specific for the profile section on the customer portal. You can find the this setting on the form options. For more information about the form builder go here. 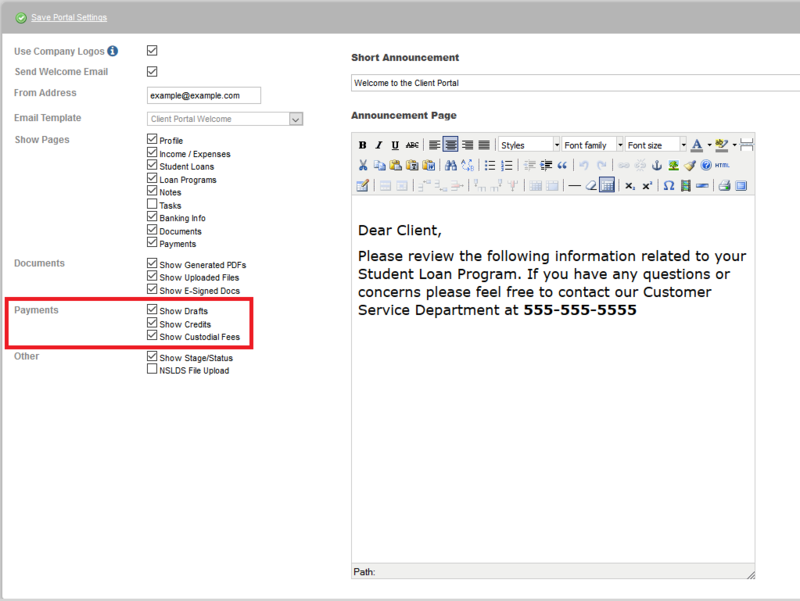 From this section the contact is able to upload the NSLDS My Student File, input their AGI and family information and generate estimates. Once complete they can choose to share the information with your company. For more information please review our loan calculator article. They can then view the estimated payment program by viewing the Programs section later. Under this section the customer is able to view past generated and e-signed documents. They are also able to upload files that will appear under the Docs Tab of the client dashboard. 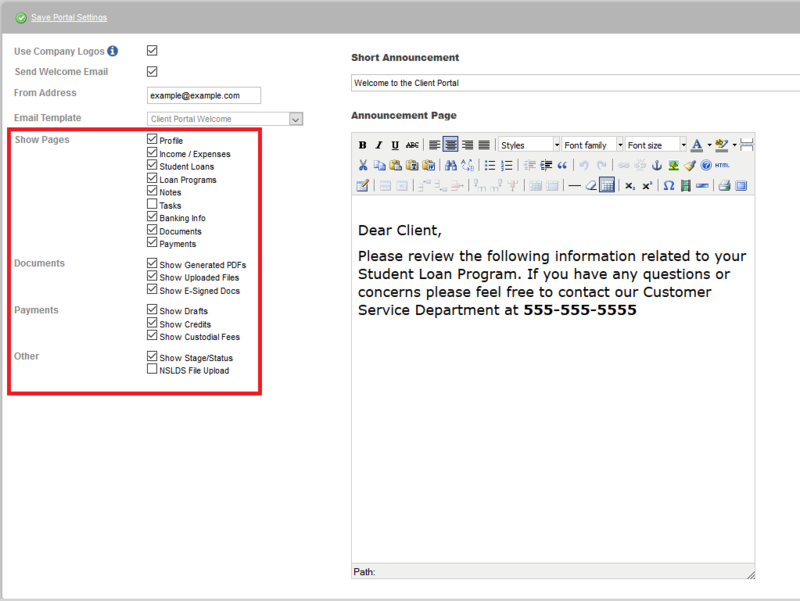 Under the Customer Portal setting you will find additional options regarding what documents will be displayed. You can choose to exclude some of the documents. You may wish to only share e-signed documents as you may have generated multiple versions of a document but only sent one for e-signature. From here customers will find information regarding their creditors and the status of their settlements. From here the customer can update tasks assigned to them. If activated there will be the additional option to assign a task to a contact when creating a task from the CRM. From here the contact can view any notes added by a user of a certain note type from within the CRM. When active you should find an additional Note Type labeled "Customer Portal". Notes of this type will reflect in the portal and be visible to the client if enabled. The customer can view their payment schedule and payment statuses. You will find additional options for what transactions will appear under the Payments Section. You may only wish for the client to see Debit transactions for the payments deducting from their account and hide Credit/Fee Transactions. 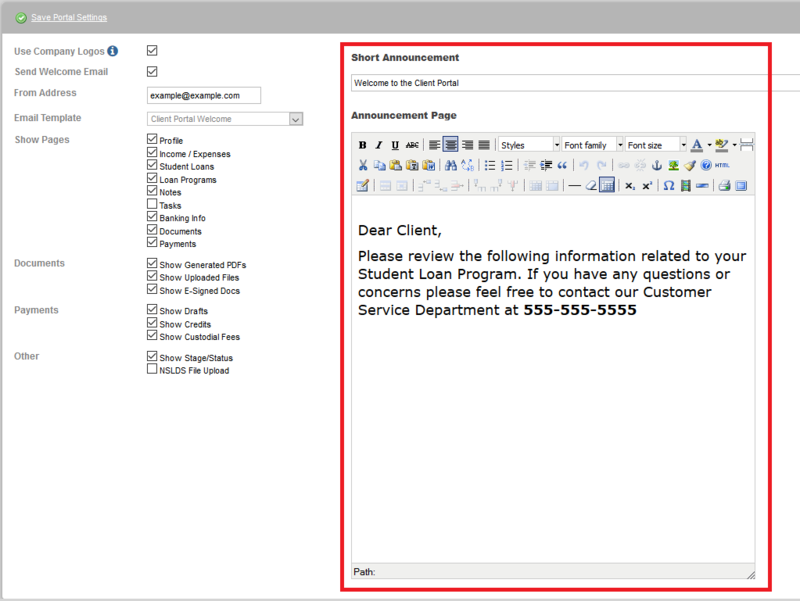 This page allows clients to send a message back to their servicing company. The message is not stored in the CRM, but instead will be delivered directly to the email address listed as the "From Address" in your Customer Portal settings. Here the customer can change their password. We suggest telling them to create a new password after logging in for the first time. There are a couple additional options you may see under the Customer Portal settings. 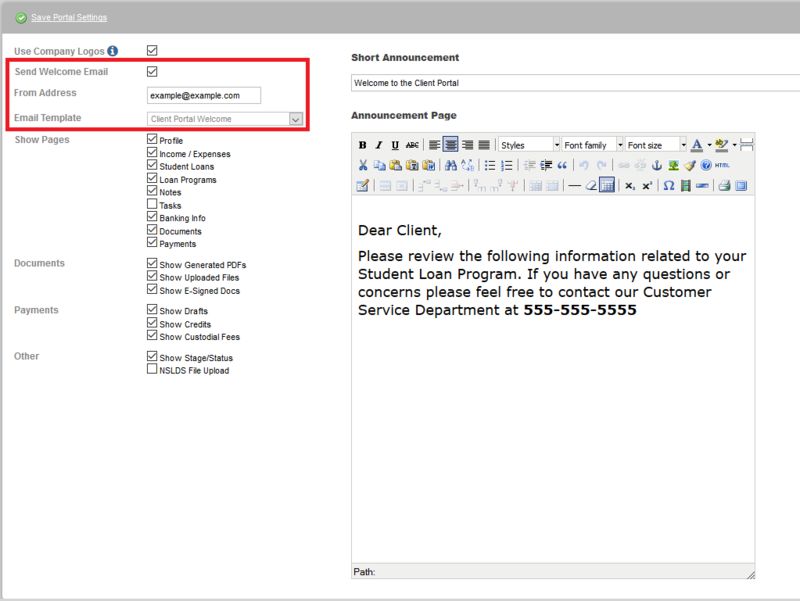 This option will replace the logo once the customer is logged in, with the one used for the company logo within the CRM. You may use this option if you are using multi-company management and wish customers from your affiliates to see the affiliate logo when logging in. A logo can be uploaded for affiliate by going to edit the company (Admin Tab > Companies > Select a company by clicking the green arrow at the end of the row) and finding the "Upload Logo" options among the company field options. *Logos will appear in their native size, we suggest making sure your logo is no larger then 90 pixels vertically. Show Stage and Status - This will display the workflow stage and status. You may wish to display this if you have configured your workflow in a manner that reflects the status for your service for with the client. NSLDS File Upload (Student Loans) - This will switch the Loan Program Section from the method where loans are pulled from the corresponding DOE Websites to the internal estimate calculator. For more information please visit our article here.